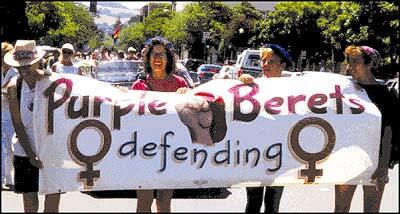 The Purple Berets is a grassroots, in-your-face women's rights group dedicated to gaining equal justice for women. We work as advocates for women who are victims of sexual assault and domestic violence and we do direct action political organizing to make system-wide change to give women access to justice. Purple Berets report on the second-degree murder trial of a Queens, New York woman who killed her husband, a retired New York City police sergeant, who had beaten and terrorized her for two decades. Barbara Sheehan Acquitted of Murder! On October 6th after just three days of deliberation, a Queens, New York jury found Barbara Sheehan not guilty of second degree murder in the shooting death of her husband, retired NYPD Sgt. Raymond Sheehan. support of individuals like you.